Our friend and longtime MER community member Fay Chiang has passed on/transitioned. I don’t usually share too much that’s personal online, but others’ generous words have helped me, so in that same spirit here are some thoughts. I met Fay through Bob Holman and Bowery Poetry. I worked with her on her book, 7 Continents 9 Lives and we became friends. On the cover of the book is the painting of hers, of a mountain against a blue sky. In the foreground, on a flower-dotted field lies a girl—a dress of soft red, white headscarf, and black boots. Next to her a white horse rests, a blanket across his back. The girl watches over the horse; she caresses it while it sleeps. Fay’s life embodied her values. She worked for human rights, locally and globally. She was a person of fierce convictions and determined activism. I learned of her work with the Basement Project, and in developing a college Asian American Studies curriculum, of her portraits of people of color unjustly killed, and of her work with Project Reach. She helped so many people, and so many people loved her. By her fine example and by the way she saw us, she made us better. In her prose piece, “A Big Round Kitchen Table,” Fay writes about the kind of life she envisioned for the future, back during a time she was caring for a father and brother, both with cancer. Through it, we see what was important to her; friends, family, light, art-making, work, animals, music. Her life embodied that vision. Fay was a member of many strong communities—poetry communities like Bowery Women (and before that, Ordinary Women), Asian American Arts Alliance, A Gathering of the Tribes, cultural and activist and LES communities, and of course Project Reach. Her birthday parties, benefits for Project Reach and its programs, were joyous events full of friends, food, music (and sing-alongs!) and love. Through the years Fay and I would meet and drink tea and talk, about poetry and art, about travel and work, about our families. We’d talk about projects we were planning and working on. 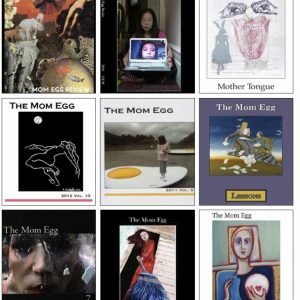 If there was a Bowery Women or Mom Egg Review reading, she would be there, no matter how she was feeling or what challenges she was facing. 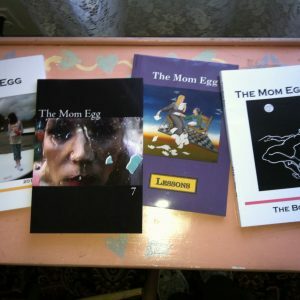 Fay contributed work yearly to Mom Egg Review. She wrote of family and personal history, work, travel, inspiration, hopes, of cancer recurrence and treatments. And she wrote of her joy and pride in her daughter Xian. Her writing reflects her spirit—pure, thoughtful, and true down to the bone. I believe that something of Fay, her tenacity and courage, her calm, engaged, and active presence, is here with us; will stay with us. I’ll carry Fay always in my heart, my mind, and in my conscience. If Fay were the mountain in her picture, she would want us to be like the girl and the horse, and take care of each other.